The next generation of Titleist’s Pro V1 golf balls promise improved performance from tee to green. Faster from core to cover, the new Pro V1 and Pro V1x have been designed to leave the clubface with more ball speed and lower long game spin for more distance, while providing the best short game control to help golfers shoot lower scores. The improvements in performance over past models have been achieved through the development of thinner outer urethane cover; a faster, thicker inner ionomer casing layer; and a new core structure. The outermost portion of the solid core Pro V1 and dual core Pro V1x have increased in stiffness, while maintaining their soft centres, creating faster engines with higher ball speed and lower long game spin. Michael Mahoney, Titleist’s Vice President of Golf Ball Marketing, said: “When we set out to develop the 2019 models, we found that golfers at every level are satisfied with the performance of their Pro V1 or Pro V1x, but at the same time, they kept telling us they would still like more distance – as long as they don’t have to give anything else up. 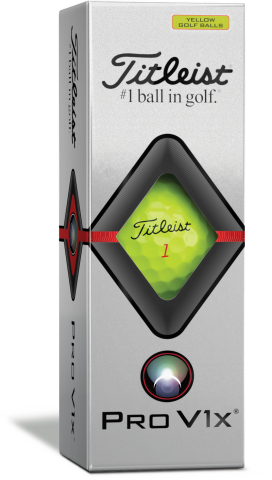 As with previous versions, Titleist says that the Pro V1 flies lower and has a softer feel than the Pro V1x, with the latter offering similar distances, but generating more spin on iron shots. Titleist has previously offered only white versions of its best-selling ball, but new for 2019 is high optic yellow model which is available for both the Pro V1 and the Pro V1x. Both balls, which are already being played by more than 60 players on tour, have an RRP of £52 per dozen. The white models are on sale now, the yellow versions will be available from March 15.